An elegant pair of diamond earrings. 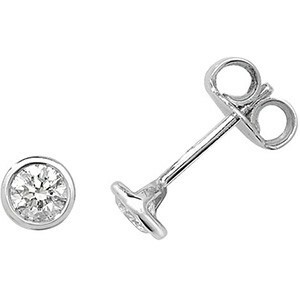 The simplicity of the design ensures that these stud earrings are all about the diamonds. Each stud is in a unique rub over setting with a single round brilliant cut diamond, a staple for any jewellery box. 0.50ct total, of 'H' colour and 'SI2' clarity. 1.00ct total, of 'G' colour and 'SI' clarity. Free gift wrapping available - presented with it's own Gift Box. 18ct White Gold and Diamonds. We recommend cleaning your jewellery with a Jewellery Polishing Cloth. Do not wear while swimming or bathing.